« Energy storage coming into its own all over the world, but there are some issues in Texas. CPS Energy’s Flexible Path plans to use fossil fuels until 2040 and beyond. The Wednesday, June 13th Public Hearing Session allows us an opportunity to speak up against fossil fuels and speak up for the well-being of our families, our communities, and our environment. Common wisdom says that if something isn’t broken, don’t fix it. But in regards to the CPS coal-fired Spruce units, there is a broken and outdated system in dire need of fixing. There are a variety of reasons to switch to renewable energy; positive environmental, public health and economic outcomes chief among them. All of these are reasons to retire CPS Energy’s Spruce power plant. 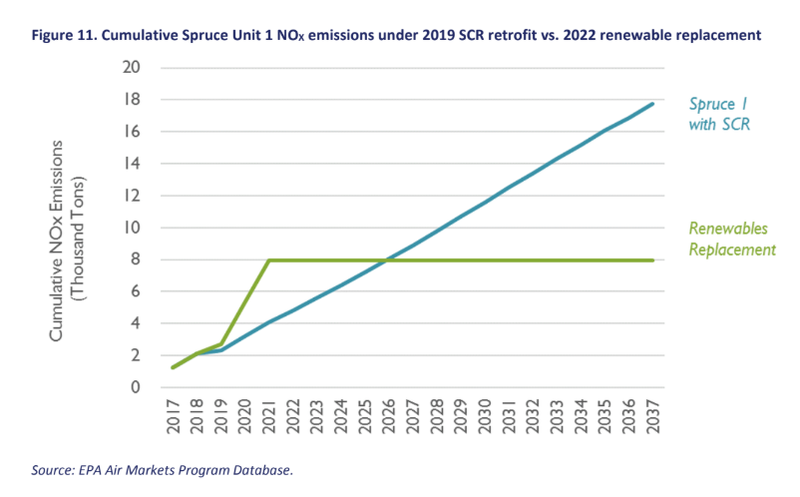 Confronted with the changing tide of technology and the public’s favorable view of renewable energy, Synapse Energy Economics conducted an analysis comparing the costs of installing selective catalytic reduction (SCR) technology in the coal-fired Spruce 1 power plant. SCR technology reduces nitrogen oxide (NOx), a toxic gas compound that can be found in smog, cigarette smoke, and vehicle exhaust. But adding SCR to a coal plant is less effective than switching to clean energy technology (see Figure 11). 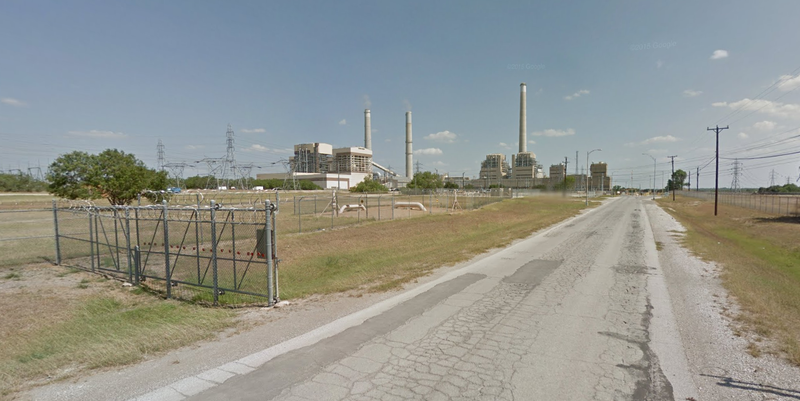 Rather than ridding Bexar County of coal plants and the costs they impose upon the environment and public health or investing in renewable energy and in our community, CPS plans to continue using an energy source known to increase rates of cardiovascular diseases such as asthma and heart disease, impair brain development in fetuses and lower life expectancy. Developed internally, without community input, the plan is called the Flexible Path. The CPS Energy Board of Trustee meetings don’t normally include citizens to be heard. This makes the upcoming public input session all the more important to attend and speak at. CPS could benefit from another bit of common wisdom: an ounce of prevention is better than a pound of cure. In addition to being a major source of pollution, the Spruce power plant isn’t economically viable. Last August, Synapse Energy Economics released a report evaluating the economics of the J.K. Spruce power plant and found it would economically benefit CPS – and by extension the taxpayer – to switch over to renewable energy. They found that Spruce 1 lost more than $20 million during 2015 and 2016 and Spruce 2 lost more than $80 million in the past two years. Part of this loss in profits comes from the decrease in natural gas prices, but even if natural gas prices were to increase again and thus increase the economic viability of the Spruce units, it is likely Spruce 1 would never recover the costs of the SCR installation. The future for the Spruce units is likely one of ongoing economic costs, and those costs will be paid by San Antonio taxpayers. Currently, almost 20 percent of our energy use comes from coal (see following table). In 2040, that percentage is estimated to drop by more than half, but the important thing to note is that in 22 years there is still estimates for coal energy use. CPS also plants to keep burning natural gas, another major contributor to climate change. And “flexible generation” is undefined, so that could also be fossil fuel-based. Just being better than a theoretical “Traditional Path” isn’t good enough. By CPS projections, we will still use coal and other fossil fuels in 2040. We don’t have time to use coal for two more decades. Presently, there is a global increase in the occurrence and intensity of flooding, wildfires, hurricanes, heat waves, droughts and other extreme weather events. San Antonio, already one of the most flash-flood prone areas in the country, will experience more extreme droughts, heat waves, and flooding. Our city is becoming hotter and hotter, and as global temperatures rise and the heat island effect worsens, San Antonio will continue to become a sweltering desert of cement and asphalt. We have the power to mitigate these consequences and contribute to the global effort of reducing and reversing the acceleration of climate change. We have the power to decide for ourselves to be the change we need to see. We have the power to demand more of CPS and of our local government. We have the power to become a 100 percent renewable energy city and challenge other cities to do the same. We join our Climate Action SA partners in calling for the retirement of the Spruce coal plant by 2025 and a transition to 100% fossil fuel-free energy by 2030. Renewable energy is increasingly favored by the public; wind and solar are now the cheapest energy sources in Texas; and renewable energy is unequivocally better for the wellbeing of people and the environment than coal and other fossil fuel sources. It’s time we speak louder and we have a chance to do so this Wednesday, June 13th at the public hearing. Come out. Speak up. Demand better. Our well-being, our communities, and our future depend on it.